The rain changed to intermittent showers by the time we got to the coast. The wind was still blowing hard, and was blowing the tops off the ocean waves. We stopped at a couple of beaches along the way, and stopped for a walk on Sea Side Beach. This home has a wonderful beach view. We let the 4-year-old run off some energy on the beach and then got back in and drove south to MacKerricher State Park. MacKerricher State Park is about 9 miles (14.48 km) long. We walked the trail to Laguna Point along the board walk through the cypress trees to the next viewpoint. There was Ice Plant blooming along the trail. It was likely introduced to help stem erosion, but it is an invasive species. At the south end of MacKerricher State Park, at Fort Bragg, is Glass Beach. Many years ago there was a town dump at the beach, the dumping began in 1906 when a large part of the town was destroyed during the San Francisco earthquake. They pushed all the garbage over the cliff into the ocean, only stopping the practice in 1967. Most of the recyclable materials were removed, but the ocean waves broke and ground down the discarded glass bottles. Collecting is discouraged on Glass Beach within and adjacent to the state park. Tourists visit Fort Bragg’s glass beaches each day in the summer. Most collect some glass. Because of this and also because of natural factors (wave action is constantly grinding down the glass), the glass is slowly diminishing. Clear glass, green glass, brown and red glass. Our grandson gathered up colorful pieces of glass, and stacked them up. Then he scattered them out again and started over. We left all the glass at the beach, not exactly how we found it, but it was still there when we left. The waves were pounding the beach, and you could hear the glass tinkling, and the rocks rattling as the waves moved back and forth. The California Poppies were also starting to bloom near Glass Beach. We stopped just south of Mendocino and took in the view across Mendocino Bay. I hand held the camera for this 9 image panorama. Traveling further south we came to Point Arena. The weather was dry and breezy and changed from cloudy to partly cloudy. The ocean swells were rolling in from the southwest and breaking along the point.Point Arena is the last landfall for the San Andreas fault, as it turns out toward the ocean. A hole opened in the clouds and the sun poked through for a few moments. There were harbor seals resting on rocks to my left, ones that the waves were not breaking over. For the next photograph I put a 6 stop neutral density filter on the lens to get a longer exposure. This exposure was 10 seconds long, and I like the misty water look over the rocks. 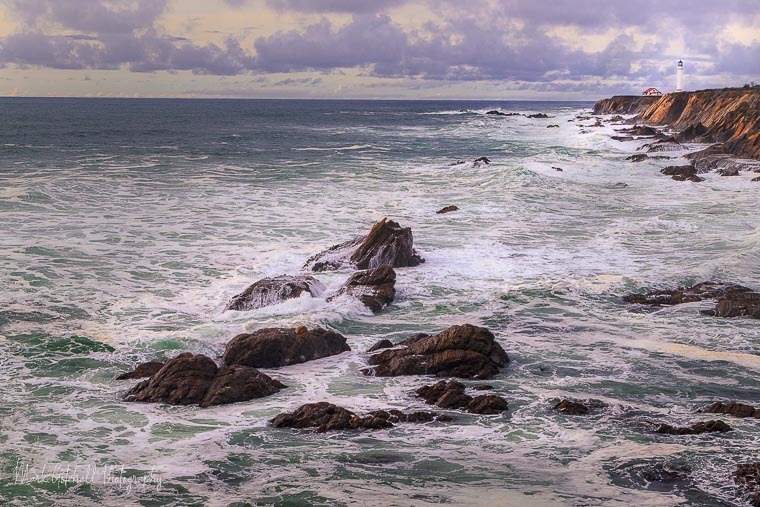 The last photograph of Point Arena has more of a “painterly look” to it. It was getting to be late afternoon, so we continued south to Salt Point to spend the night at a campground there. Every park we stayed in so far, had no cell service. I made certain to check the weather report when we went through Gualala, before we went out of cell coverage again. Next up Sonoma County, California Coast.